Yesterday when I tried to upload the video to YouTube I got an error called “The upload failed due to an unknown error” this error doesn’t say what is wrong with my video it just saying some error occurred on uploading. I tried many times to upload video to YouTube with different browsers also but the result is same YouTube upload error. I searched it on Google to find solution to YouTube upload unknown error but no one is providing proper answer to it. Here is the solution to YouTube upload failed problem which I discovered. When I was searching for the solution for YouTube upload error I found that this thing is happening to most of YouTube users and YouTube upload error is causing because of bug in YouTube uploader and not by the mistake of YouTube users. YouTube employers has said in forum that they have an issue with YouTube uploading system and they are trying to resolve it, but not yet done. If you are also getting YouTube upload error, then here is the simple solution what I have discovered. By default you will upload video to YouTube in this location (see the image) if this uploading option don’t work for you then scroll the page below you will see Basic Uploader option try it, it will works like charm. 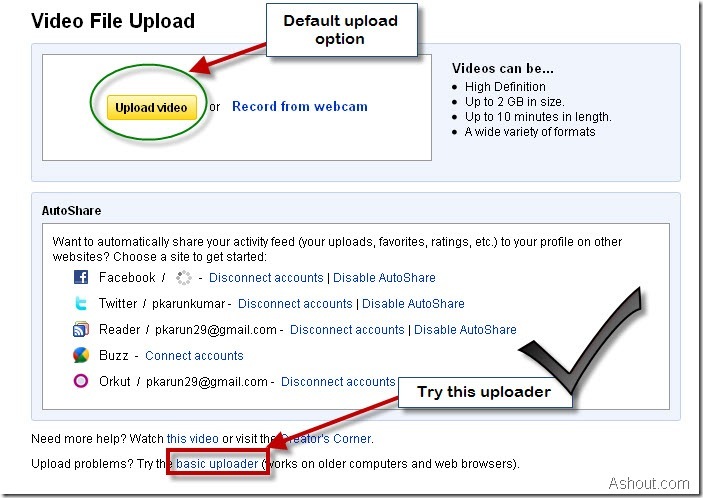 By using Basic uploader option we can upload video to YouTube without any YouTube upload problems. Hope this will solves your YouTube upload error. I am gonna test that out. Becoz I am already furious with that error problems. I tried in 32bit computer, worked fine for me. I have tried everything to upload my videos on YouTube and despite all the advice nothing works! I give up and will NEVER use YouTube again. I hope the problem causes them to lose money as it’s wasted a lot of my time and bandwidth. The basic uploader doesn’t work any better. Neither does the new Java “resumable” upload (and it doesn’t resume where it stopped, either). Are there any other fixes for this problem? disabled AV & FW.. still didn’t work :/ youtube suxx! Funciono el Basic Uploader para mi. Gracias!! Thank you! This simple solution worked! Thank you so much! This was driving me CRAZY! Your blog is the only place I’ve found a helpful answer! A thousand times– thank you!